Census records have been kept by many countries and nations for centuries. While census records may record businesses, veterans, farms, or animals, a population census usually counts of every living person within a geographical boundary. The United States federal census population schedules contain a wide variety of valuable family history information. They may include names, birthdates, and birthplaces of ancestors. They may also contain occupations, family relationships, land ownership values, and the year an ancestor came to the United States. Because federal census population schedules were gathered every ten years, it is one of the best ways to locate ancestors over several generations with ease. Federal census population schedules may be supplemented with non-population schedules, state census population schedules, vital records, and other historical records. Why were census population records created in the United States? Census records were created to help identify how much government representation each state should have in Congress, and required a count of all land-owning citizens throughout the country. In 1790 these records included only the names of the heads of household along with tally marks indicating the ages and genders of other members of the household. Starting in 1850, every person in the household was named, including their age, birthplace and other details. How do I search the 1850-1930 censuses? First, identify an ancestor born prior to 1930. It is helpful to know the state where they lived and/or the ancestor's approximate age in 1930, but not necessary. If the ancestor was female and not yet married, search for her first name and her maiden name if it is known. If the ancestor was an adult, search backward through each decade until the individual is young enough to be listed with parents or guardians. If the ancestor was a child, the search results may list the ancestor's parents and siblings living in the same household. Pay attention to where the parents were born and their ages. Repeat the same process with the parents of the ancestor, searching until you find them listed as children with parents. To locate female ancestors' maiden names, locate marriage records for the mother and father. Look for the marriage record in the state and/or county where the oldest child was born. Where is the 1890 census? Records for about 6000 individuals survived the destruction of the 1890 federal population schedule of the census, originally containing about 62 million individuals. Prior to the existence of the National Archives to house records, the 1890 census were stacked outside of a waterproof, fireproof record vault in the basement of the Commerce Building in Washington, D.C. They were severely damaged during a basement fire. While only 25% of the records were destroyed by fire, the remaining records were later destroyed due to severe water damage. 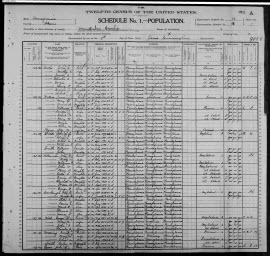 How do I search census records prior to 1850? Only the names of the head of household are listed in census records between 1790 and 1840. This makes locating ancestors a bit more challenging, especially if an ancestor did not own land or was living with a relative or friend. The other household members are grouped by age and gender with tic marks indicating how many individuals fell in that age bracket. This can make earlier census records seem impossible to search. Using the 1850 census as a guide, subtract ten years from each family member's age. If the age is zero or less, this person will not appear in the 1840 census. Divide the remaining household members into groups of gender and race and count the number in each group. Search for the father's name in the 1840 census. If he appears there, then match the ages of the family members with those on the census to determine if this is the correct family. Remember that there may be some extra individuals in the 1840 household including daughters that may have been married by the 1850 census, cousins, parents, and others. If the father's name does not appear in the 1840 census, and he should have still been married in 1840, the family may be living with a relative or friend. It is helpful to be familiar with nearby relatives with whom they may have lived. If you know their names, search for those relatives (parents and siblings are most common) and see if their household includes males and females matching the age of your family. You may also check against the 1830 census to see if the household contained individuals of the same gender that were ten years younger. Why can't I find census records later than 1930? Census records are protected by privacy laws that only allow public access to records older than 72 years. That means that in 2012, public access will be granted to the 1940 Census. You may request access to any census record (1940-2000) from the Bureau of the Census from if the person requesting the document is the person named in the census record, or is a proven heir or legal representative of that individual. Why I can't find my ancestor in the census? I know this ancestor lived in the United States during the census years I am searching. Type only part of the name, or try a shortened version of the name. For Leonard, try Leo. For Margaret, try Peggy or Maggie. Try a middle name or first initial instead of a full first name. Use the unique first name of a sibling or parent to locate the family. If that doesn't work, try locating a neighbor that showed up in a later census that might have lived nearby ten years earlier. Search for all individuals of a certain last name within a specific district or county. Statewide might work if the last name is unusual. Name spellings may change. Sometimes census enumerators (those recording the information) would ask nearby neighbors the names and ages of a family if the family wasn't at home when the enumerator stopped by. Also, illiterate individuals may not have known the correct spellings of their names. Remember that boundaries of states and counties may have changed between census years. Families may live in the same place, but be listed under a different county. Broaden your search to see if they may appear in a different state or nearby county. Learn more about the U.S. federal population census at www.archives.com/census.